This is taken from one of the crests on Wetherlam's south ridge. In the foreground is Little Langdale Tarn with Lingmoor Fell on the left. Beyond, and in the centre is Silver How leading up to Castle Crag on the left. 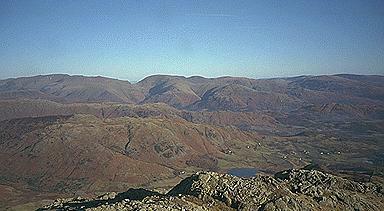 On the horizon, on the left, the northern range of the Helvellyn fells are bunched together, though the pointed crest of Helvellyn Lower Man can be seen to the left of Helvellyn itself. Nethermost and Dollywagon Pikes continue to the right with Seat Sandal in front of them. After the gap of Grisedale, Fairfield, Hart Crag and Dove Crag follow, then High Raise, Red Screes and High Street.